Comparison of genetic diversity across the paleopolyploid genome of Brassica rapa. Genomic data from more than 100 newly sequenced accessions of B. rapa crops are included in the analysis. These include turnips, field mustards, Chinese cabbage, pak choi, sarsons, and rapini. From Qi et al. in prep. We study the origins of biological diversity, particularly how abrupt genomic events such as polyploidy (genome duplication), chromosomal change, and hybridization have contributed to the evolution and diversity of life. Biologists have long been fascinated by these processes because they create unique opportunities for the evolution of novelty with the potential for relatively rapid diversification. While assessing the roles of these genomic changes in evolution has historically been a difficult task, advances in genomics and computational biology have created new opportunities for addressing these longstanding questions. 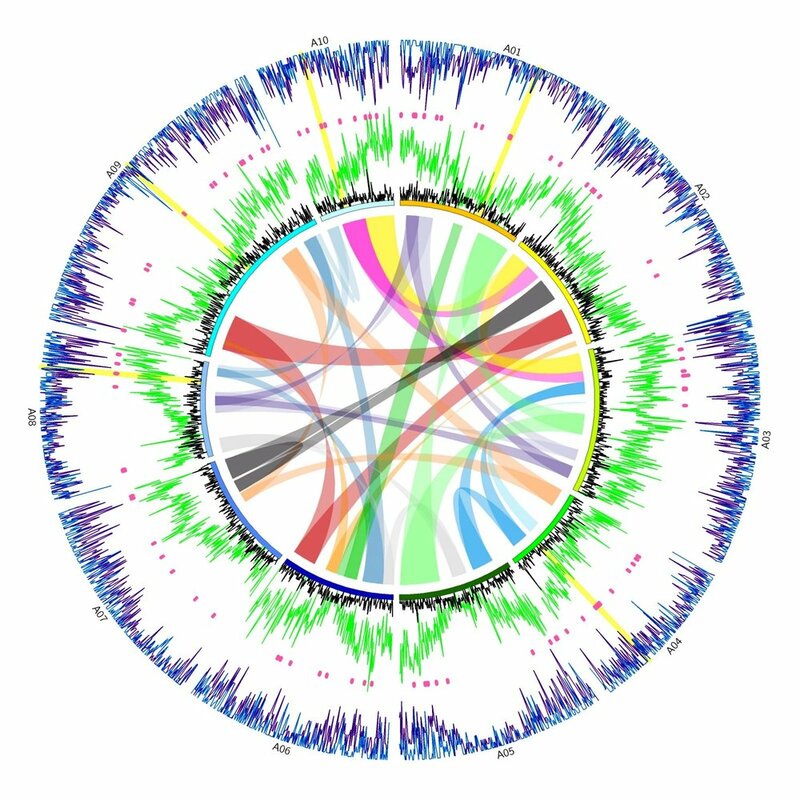 Our research program integrates new computational and evolutionary genomic tools with traditional approaches such as molecular evolution, phylogenetics, mathematical modeling, and experimental work to better understand the origins of biological diversity. We use a combination of publicly available genomic data and new data generated by ourselves and collaborators from a diverse set of study systems. Our ultimate goal is to connect patterns of genome evolution across time scales by leveraging systems where we can study microevolutionary processes to inform our understanding of macroevolutionary patterns. 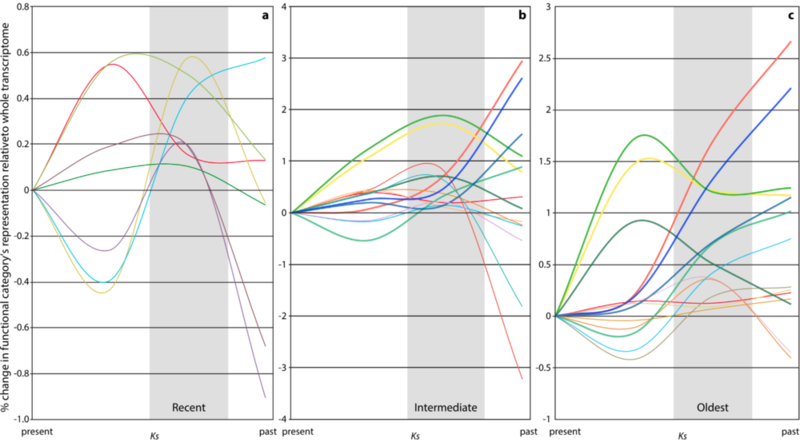 Simulation analyses of the diversification of diploid and polyploid lineages with independent speciation and extinction rates. From Arrigo & Barker 2012. How does polyploidy influence rates of adaptation and speciation? Do changes in the efficacy of selection in polyploids lead to higher rates of adaptation or impede evolution relative to diploids? How may the population genetics of polyploid species influence their macroevolutionary outcomes? Why do polyploid species diploidize if they were successful as polyploids? Does natural selection or drift drive diploidization? Are there universal rules that govern genome evolution following genome duplication? What are the relative roles of natural selection and drift driving the retention and loss of genes following polyploidy? Does dosage-balance constrain the evolution of large fractions of paleopolyploid genomes? How do multiple origins of polyploid species contribute to polyploid success? Does a single genome organization emerge from multiple origins? If so, does selection or drift drive the evolution of genome organization from multiple origins? Are polyploids of different origins interfertile? How does hybridization influence the evolutionary success of polyploids? Do allopolyploids or autopolyploids have an evolutionary advantage? Does hybridization (and polyploidy) itself create evolutionary novelty or does simply cutting off gene flow from the broader species range allow rare genotypes to persist and proliferate? Why do rates of chromosome gain and loss vary dramatically across the phylogeny? How do these rates impact diploidization following polyploidy? What evolutionary forces drive the gain and loss of chromosomes, and ultimately the evolution of chromosome number? Differential gene retention and loss following WGDs in the Compositae (Sessa et al. in prep). We also actively develop and maintain a suite of evolutionary bioinformatic tools to facilitate our research. Our tools are hosted at our public facing server, EvoPipes.net. We are currently developing new bioinformatic approaches for identifying and analyzing ancient whole genome duplications and hybridization. If you are interested in software or bioinformatic algorithms, we would be happy to have you join us! 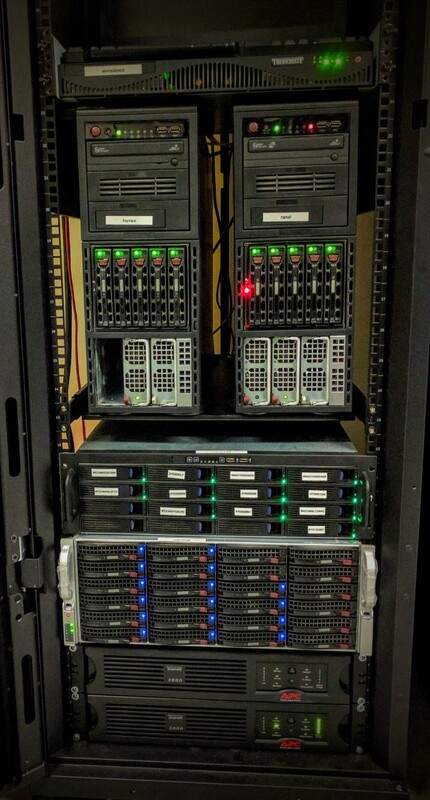 Some of the servers that power the Barker Lab: Ratel, hyrax, and packrat.